Background: Thrombus is composed of two main substances i.e. red blood cells and aggregated platelets which make a web of inter-connected fibrin proteins. During injury it prevents bleeding, so it is very useful but it can be very dangerous if it is produced in healthy blood vessels and block the blood flow through it. Mural thrombi attaches with the blood vessels but in most cases do not block it completely. Venoms are an incredible source of peptides having amazing bioactivities with varying number of amino acid residues. Anticoagulant venom peptides however inhibit the enzyme taking part in coagulation like factor Xa and thrombin. The anticoagulant potential of venom peptides have also been reported by the degradation of the fibrin or fibrinogen related to serine or metalloproteases. Designing and development of numerous therapeutic agents or lead molecules mostly for cardiovascular diseases have been motivated from toxins/proteins from snake venoms. For example, disintegrins, a large family of platelet aggregation inhibitors found in viperid and crotalid snake venoms were the basis for designing of platelet aggregation inhibitors such as eptifibatide and tirofiban. Conclusion: Ancrod isolated from Malayan pit viper venom can cause reduction in level of blood fibrinogen and has been effectively tried in various ischemic conditions, including stroke. 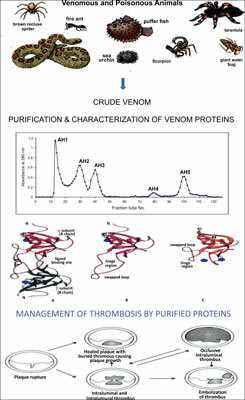 In order to search for novel lead molecules, the emphasis should be on isolation and characterization of pharmacologically active snake venoms proteins affecting blood coagulation and platelet aggregation. In this review an attempt has been made to recapitulates and discuss venoms of different animals and arthropod having anticoagulant peptides for their potential use in therapeutics and diagnostics. Hemostasis, thrombogenesis, anticoagulant peptides, snake venom, scorpion venom, deep-veinthrombosis.